a person or thing that acts or has the power to act. an act or instance of animating or enlivening. The number of offenses reported. A small room in wich a prisoner is locked up. Non-profits that operate within a single local community. They are essentially a subset of the wider group of nonprofits. Like other nonprofits they are often run on a voluntary basis and are self funded. a glass-enclosed, elevated structure for the visual observation and control of the air and ground traffic at an airport. something that is substituted or proposed for what is wrong or inaccurate; emendation. the act of correcting. punishment intended to reform, improve, or rehabilitate; chastisement; reproof. 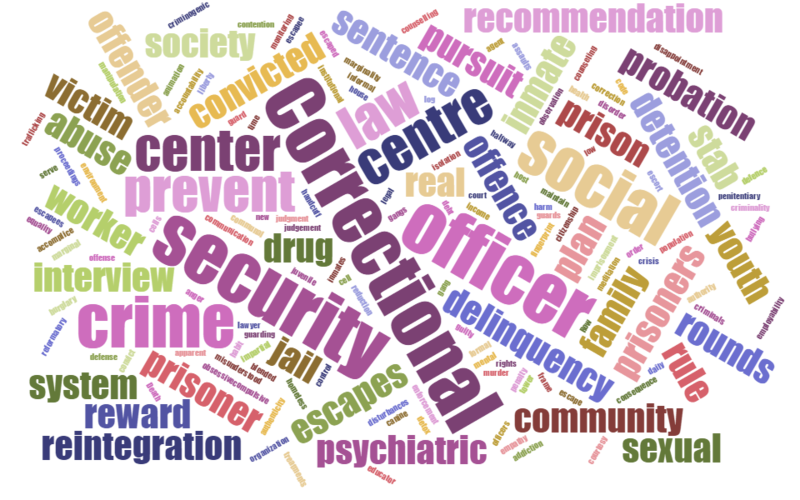 An analysis of a prisoner’s social and psychological shortcomings – the things driving his anti-social behaviour – and a list of the ‘intervention’ programs that the prisoner must participate in, in order to be eligible for release. The provision of assistance and guidance in resolving personal, social, or psychological problems and difficulties, esp. by a professional. A law that codifies most criminal offences and procedures in Canada. An act punishable by law; usually considered an evil act; "a long record of crimes"
Factors, innate or acquired, which can encourage criminality. a dramatic emotional or circumstantial upheaval in a person's life. The sale and distribution of illegal drugs. a person or thing that educates, especially a teacher, principal, or other person involved in planning or directing education. Have a scheduled interview with a client to fetch specific information. To make a person appear as the perpetrator of a crime that he/she did not commit. Have a spontaneous interview with a client to get specific information. Intervention environment, resulting from the state, which aims to intervene with a target clientele. Take part in an action to settle a problem of a person or situation, with words or gestures. A plan made ​​by an intervenor and his client, who will work on his issues. A place for the confinement of people accused or convicted of a crime. A court that hears cases and makes decisions based on statutes or the common law. Sociology . marked by contact with disparate cultures, and acquiring some but not all the traits or values common to any one of them. Action to contemplate, wearing a reflection on an committed infraction . an act or instance of noticing or perceiving. someone who violates or transgresses (a criminal, religious, or moral law). Violation of a law that is punishable by a sentence. A prison for those convicted of major crimes. A person legally held in prison as a punishment for crimes they have committed or while awaiting trial. an officer who investigates and reports on the conduct of offenders who are free on probation. Total offenses reported (apparent crime) and offenses that haven't been reported (black figure). A suggestion or proposal as to the best course of action, esp. One put forward by an authoritative body. One of a set of explicit or understood regulations or principles governing conduct within a particular activity or sphere. Limitation or absence of danger to physical, psychological and material security in a particular area. Rehabilitation allows a person convicted of criminally not be agaisnt his conciction. It is restored in its law. person who speaks formally before an audience; lecturer; orator. technics, ( used with a singular or plural verb ) the study or science of an art or of arts in general, especially the mechanical or industrial arts. Techniques used to stop or change a negative behavior of a client in a positive behavior. identical or consistent, as from example to example, place to place, or moment to moment: uniform spelling; a uniform building code. Be regarded as being particularly sensitive to becoming a victim of an act or a given phenomenon. A place or organization providing leisure activities for young people.